Hands-free storage system: Hänel Storage Systems, a manufacturer and integrator of automated vertical storage units, has introduced augmented reality (AR) features for use in conjunction with its storage systems. 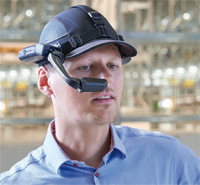 Through the use of wireless "data eyeglasses" and pick-by-voice technology, a Hänel Lean-Lift vertical lift module (VLM) can be operated hands-free, without the use of a system controller or keyboard. The optical AR device uses voice commands to accomplish data input and item selection. While wearing the AR display, users can view all relevant data and information regarding a stored item, including its description, photograph, and stored location. Once an item is requested via voice command, the storage system automatically brings it to the access point for retrieval. The item's position on the shelf can then be identified by Hänel Pick-o-Light, a moveable LED unit inside the access point that shines a targeted beam of light precisely on the specific item awaiting retrieval. 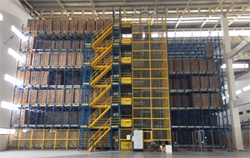 Vertical storage solutions: Ferretto Group, a supplier of material handling and storage solutions, has introduced vertical storage systems designed for space optimization and improvement of picking and storage operations. 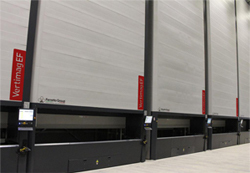 The systems, the vertical lift module Vertimag EF and the vertical carousel Eurot, are both goods-to-person automated storage and retrieval systems, the company says. By taking advantage of unused overhead space in a facility, the solutions allow companies to maximize square footage, storing more in a smaller footprint and avoiding the need for facility expansion and/or relocation. Another benefit to using vertical storage solutions is improved efficiency in picking and fulfillment functions, the company says. By delivering the required tray or shelf directly to the operator in just a few seconds, the systems eliminate the time spent walking and searching for parts. Operators are more accurate and faster, and the order picking process is optimized. All picking operations are monitored and documented to offer full traceability of the orders and to monitor inventory in real time. 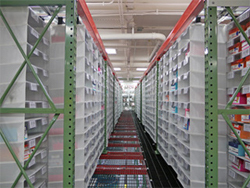 High-density storage solution: Order picking solutions provider Unex describes its SpeedCell system as a revolutionary high-density storage solution that takes unused rack space and turns it into consolidated high-density picking areas. According to the company, SpeedCell consolidates storage capabilities and increases pick facings, resulting in greater stock-keeping unit (SKU) density for less travel and search for order pickers. Each individual cell holds 35 pounds; a column can hold up to 240 pounds. Each column is suspended from a pre-galvanized steel track system that integrates directly into existing pallet rack beams. The company says it recently began manufacturing the device from a new high-flame-resistant material. Mobile-controlled vertical storage lifts: Weland Solutions, a manufacturer of customized lifts and warehouse inventory solutions, has upgraded its Compact vertical storage lifts to allow users to control the machines via mobile devices instead of a computer. According to the company, this small investment offers significant benefits, especially for pick-intensive businesses in e-commerce and the retail trade. With the new system, the warehouse associate starts the order directly from his or her mobile phone or tablet computer and only sees his/her order on the screen. This saves a great deal of time and walking along aisles, while reducing the risk of picking mistakes, the company says. Compact vertical storage lifts are controlled by the equipment maker's own warehouse management system, Compact Store. The system includes support for all of the work steps that are included in normal storage management. All of this is now available on a mobile phone or tablet computer via Wi-Fi. Feedback: What did you think of this article? We'd like to hear from you. DC VELOCITY is committed to accuracy and clarity in the delivery of important and useful logistics and supply chain news and information. If you find anything in DC VELOCITY you feel is inaccurate or warrants further explanation, please ?Subject=Feedback - : Spotlight on ... storage equipment">contact Chief Editor David Maloney. All comments are eligible for publication in the letters section of DC VELOCITY magazine. Please include you name and the name of the company or organization your work for.